Continuing with the food theme, I was inspired to take shots of my breakfast recently by a number of happy factors. 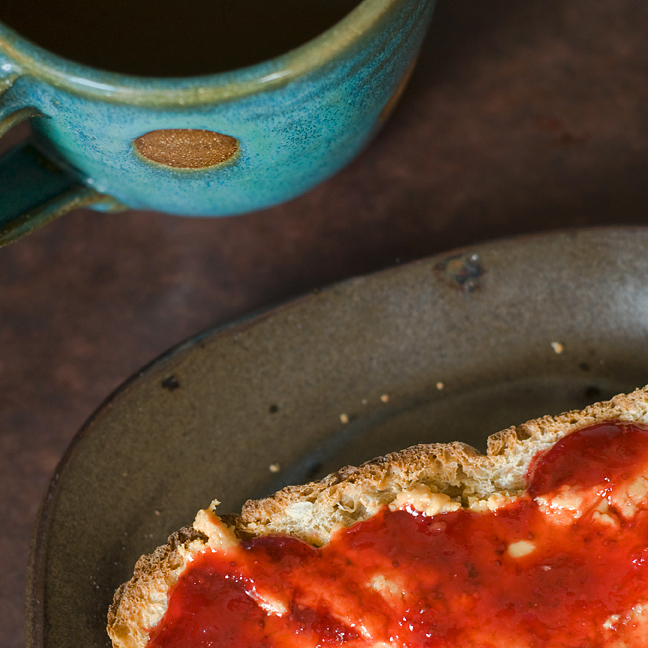 The first inspiration was the color of this strawberry jam handmade from strawberries grown by a colleague of my husband’s who lives on acres upon acres of farmland in middle-of-nowhere Nebraska (and who was kind enough to bring us a jar of this beautiful stuff on a recent visit). Can you beat that color? It just sung out to me and I knew I had to do something with it. When I put my favorite coffee mug down next to it, I saw a veritable color explosion and grabbed my camera. The pottery was the second inspiration for my photo. Both the polka-dot mug and the dish holding the toast were handcrafted by the super talented Lulu Trout of Lulu Ceramics. It may be absurd, but what I eat my food on really does affect how much I enjoy it. I’ve been known to pitch a fit if my favorite coffee mug is not clean in the morning and to sift through a stack of different colored and shaped plates to find the one I’m most in the mood for. And last but not least, the sunflower spelt that comes piping hot and perfectly plump out of the ovens at Scratch Baking Company on Saturday mornings, was the third inspiration for this photo. I am in love with that bread and I’ve witnessed my friend, neighbor and Scratch’s co-owner and head bread baker extraordinaire, Allison Reid, tweak the recipe to absolute perfection over the past few months. It is at once hearty and airy, and full of wheaty goodness. So to all of you who bring beautifully crafted treasures and colorful tastiness to my life, I thank you for inspiring me. This entry was posted in food and tagged ceramics, food photography, Lulu Trout, Scratch Baking Company, spelt, strawberry jam on May 27, 2009 by Stacey Cramp.